Back in 1984, the year emblazoned on the Holland Christian Middle School cornerstone, we still had the same ideals, the same mission that we do today. We built our Middle School then so that we would have a great place to educate middle school kids well, to equip their minds and nurture their hearts for what we still believe is the most important cause in the history of the world–to live for and transform the world for Jesus Christ. No light or flippant task, we realize, and one we still take seriously today. But we’ve changed significantly the way that we teach that mission, as we have changed our teaching methods over the years. We now know more about the science of student learning, and while our old technique of whole-group instruction (aka lecture) remains an important tool, it is no longer the sole model for teaching and learning. Instead of teachers being the focus of class, student learning has become our focus, as well as the ability for students to demonstrate that learning each class period. So in any given day, we as educators need space to teach to a whole class, but also need to be able to break up easily into small collaborative and investigative groups, while also accommodating individual students working. All of these varied learning methods require more flexible learning spaces than what we currently have. 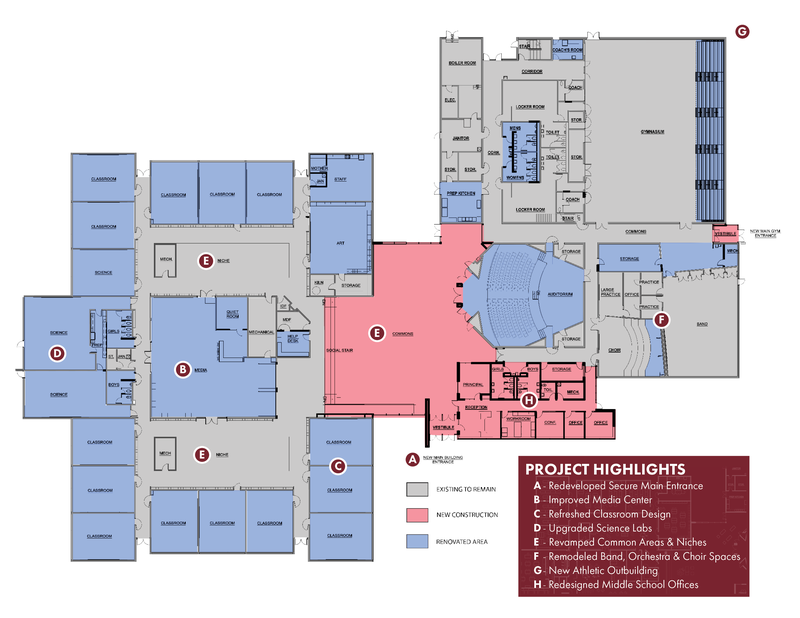 With a significant middle school building renovation, we want to be able to accommodate these varied teaching methods, while also fiscally responsible. We don’t necessarily need a much larger building, just a more flexible one, with the current space used more efficiently and effectively, as well as mended where needed. Essentially, we want the capability to effectively utilize the whole building as an instructional environment, thereby expanding—and improving—student possibilities and learning. 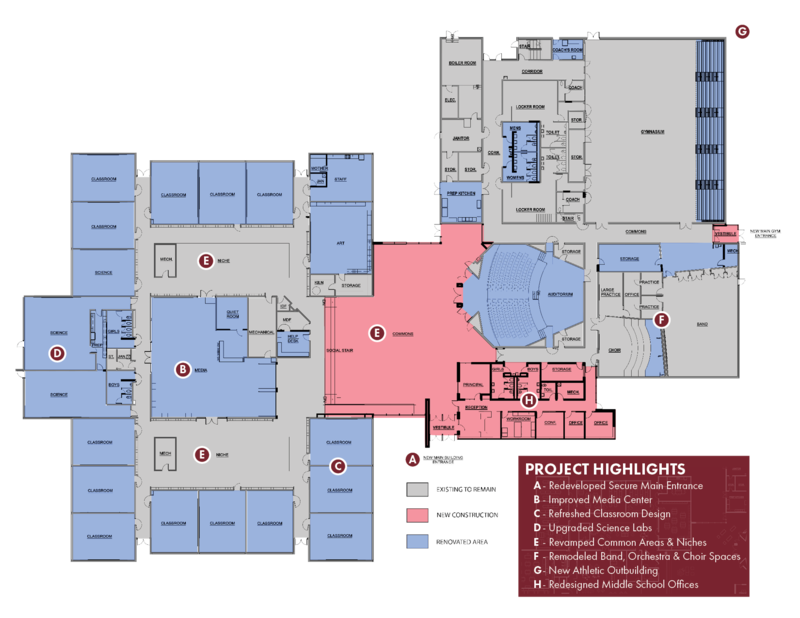 There are other building changes we need to implement as well to maintain a healthy and safe building and continue to provide the kind of education we have all come to expect and love from Holland Christian Schools—greater security, a renewed infrastructure, and a more gracious athletic community space—all of which are laid out below. You can check out the Project Highlights Plan and the architects’ design, and then read the explanations in the brochure following. Thanks for your willingness to reach out a hand of offering, assisting Holland Christian Middle School in this mission of ours, as we continually strive to provide the best possible learning environment for all our students. Thank you for demonstrating the Lord’s grace in improving our middle school building to better equip minds and nurture hearts of those students inside, as they prepare and work to transform the world for Jesus Christ!